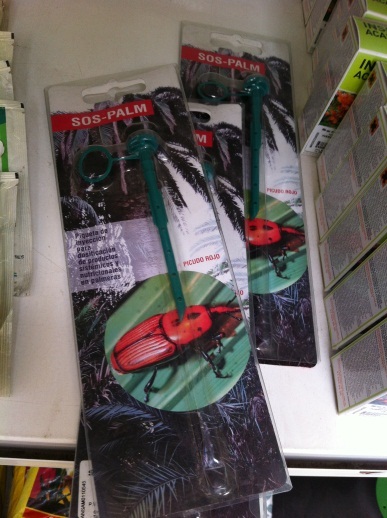 The palm butterfly & Red Palm Weevil: everything you need to know! 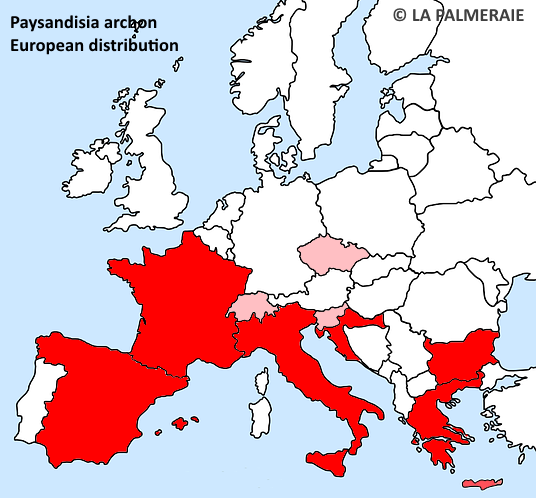 In the Southern Europe, they form a real plague. Fortunately, they are still relatively unknown in our Northwestern regions. 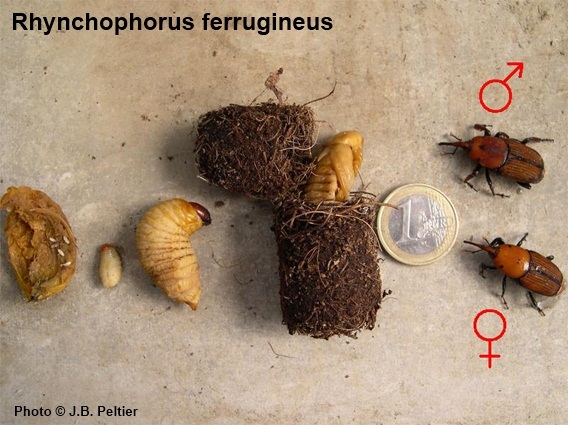 Both the palm moth (Paysandisia archon) and the Red palm weevil (Rhynchophorus ferrugineus) destroy whole areas with once so beautiful palms. Especially for those who have a residence down there, for those who already had to deal with it or just for those who are interested, we describe in this article all the relevant aspects and of course the treatment of these pests. Strikingly large and impressive insect. Can be relatively aggressive when he feels threatened. 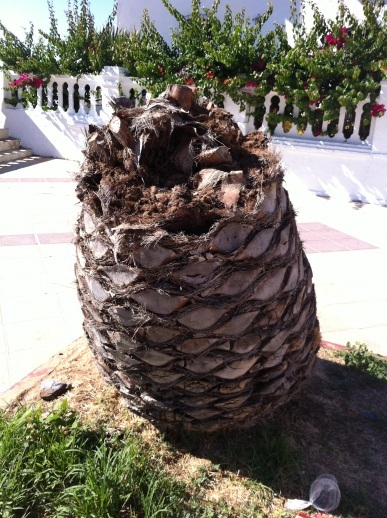 Palm moth: in Europe since the 90s, by imports of palm trees into Spain (such as the Butia). Then progressed to Portugal, France and Italy. Contrary to common belief, it is not the climate that prevents further spread to the North! The larvae are even very cold resistant. The palms in the North are simply too far apart. However, the lower temperatures are also a determining factor, as the palm moth does not fly and does not reproduce during colder, windy periods. 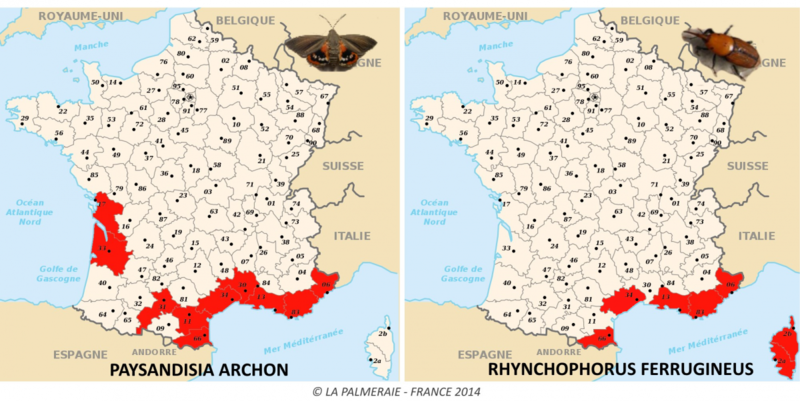 In France, it is mainly the palm moth that causes the greatest destruction. The red palm weevil is less widespread. 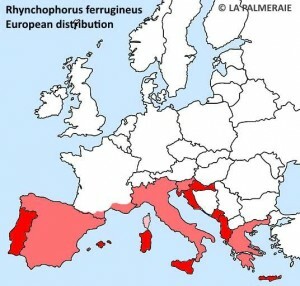 Red Palm Weevil: in Europe since 2000, through Spain and then Portugal and France, where it is mainly the Cote d’ Azur that is abandoning this scourge. He can be found from Marseille to Nice but also in Perpignan and Corsica. It is also widespread in smaller municipalities, mostly due to the transport of goods. Palm moth: Adult insects appear during the summer season (June-September) and fly during the hottest hours of the day with reproduction as the sole purpose. 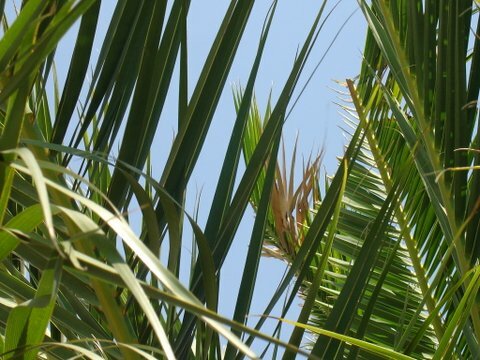 After being fertilized, the female lays between 100-150 eggs in small groups (per 2 to 3), in the soft parts just under the leaf crown of the palm but sometimes also in the fibres (e. g. Trachycarpus). After two weeks, the eggs hatch and the larvae immediately gnaw their way to the heart of the palm. The larvae stay in the palm for 10 to 18 months (several seasons!) during different stages before transforming. 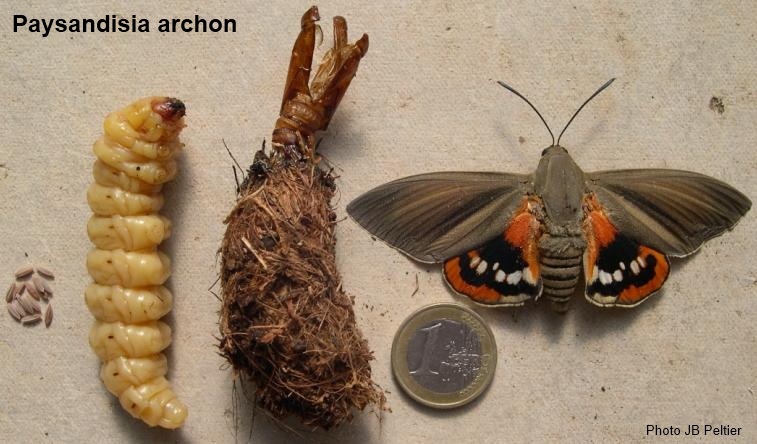 2 to 3 months after pupating, the larva has been transformed into adult palm moth. 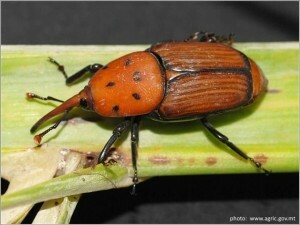 Red Palm Weevil: lives throughout the year in which he is active all day long. Only a decrease in activity can be observed between December and March. The adult individual lives about 3 months where he feeds on sweet food such as honey, dates, apples etc. The female can be fertilized several times and then lays her eggs one by one (up to 300 pieces) deep in the leaf crown. 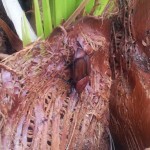 2 to 5 days later the larvae appear, forming gagging galleries to the heart of the palm. 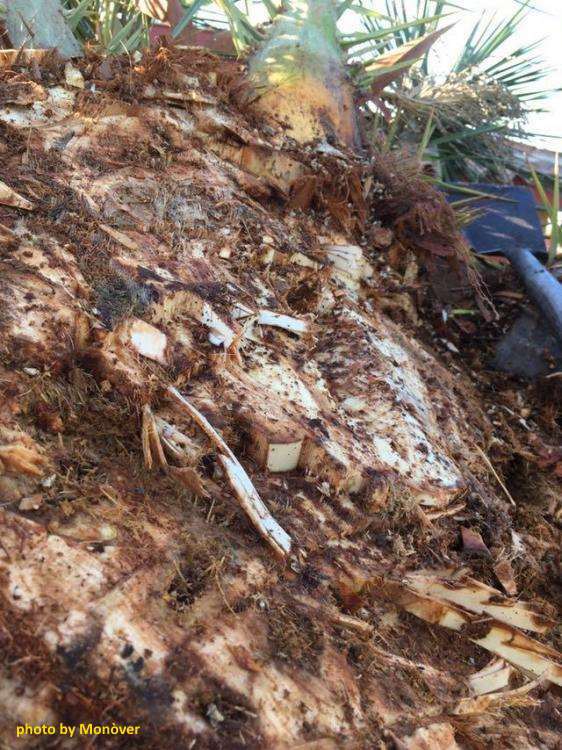 The destroyed parts rot and thus significantly increase the internal temperature of the palm, which the larvae then benefit from. Between 25 and 105 days later (depending on the circumstances) the larvae move to the palm’s petioles to transform. 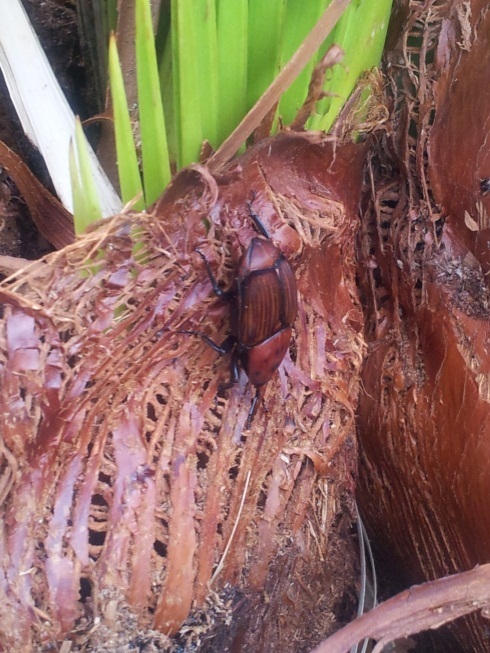 With this short life cycle, the red palm beetle can produce several generations per season! 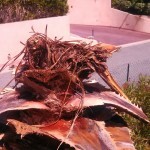 Damage to the palm can be such that the palm collapses completely. 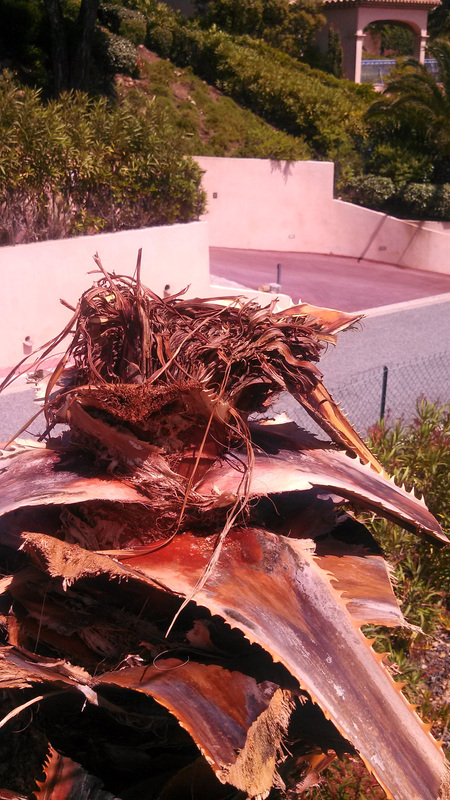 Palm moth: great preference for fibrous stems and especially the Trachycarpus. Especially on freestanding sunny locations. 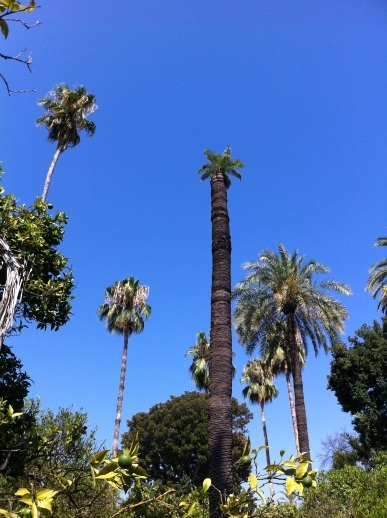 Basically only adult palms up to 10 meters high. Preference for already weakened palms. 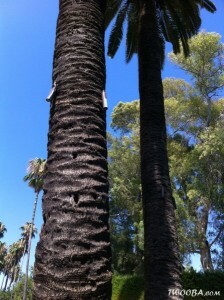 They return to the same place so the same palm can be attacked repeatedly. Red Palm Weevil: very great preference for Phoenix, Washingtonia and Pritchardia. 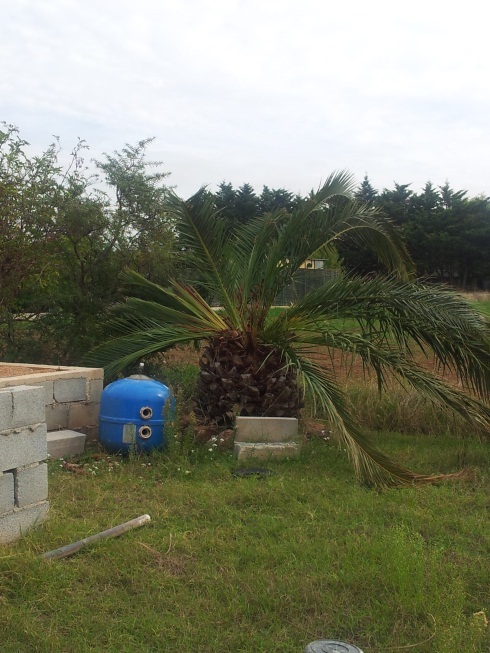 In France, the Phoenix canariensis, which is often planted, is the main prey. NB. 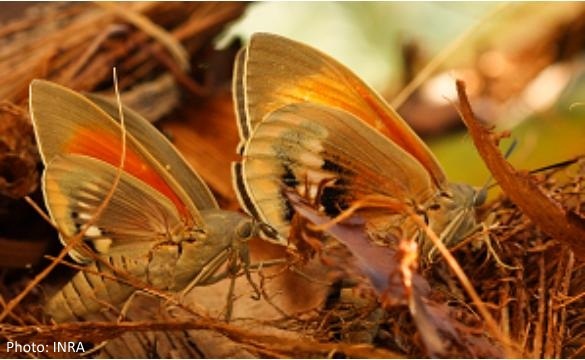 When pupae are found it is a lot easier to determine which insect is causing the problems. The texture of the pupal case of the palm moth is different from that of the red palm weevil. NB. Phoenixes can hide an attack for a relatively long time. Detection is therefore not always easy and sometimes even comes too late. Sometimes the palm seems in excellent condition, while more in-depth research shows that the whole inside has already been completely destroyed. Be careful not to confuse these very specific symptoms with more innocent things like traces of insect gnawing such as crickets or cicadas. 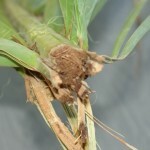 The fungal infection Fusarium can also cause parts of dried leaves. 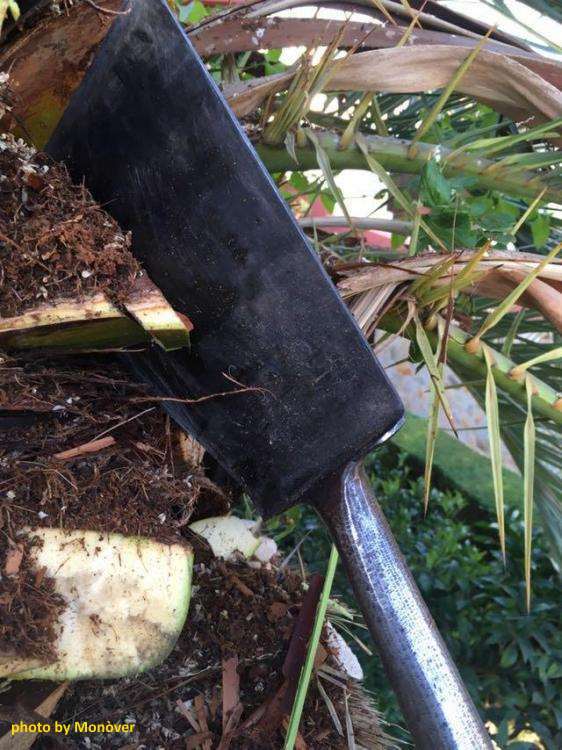 Winter damage can also cause a sudden drop in the palm. 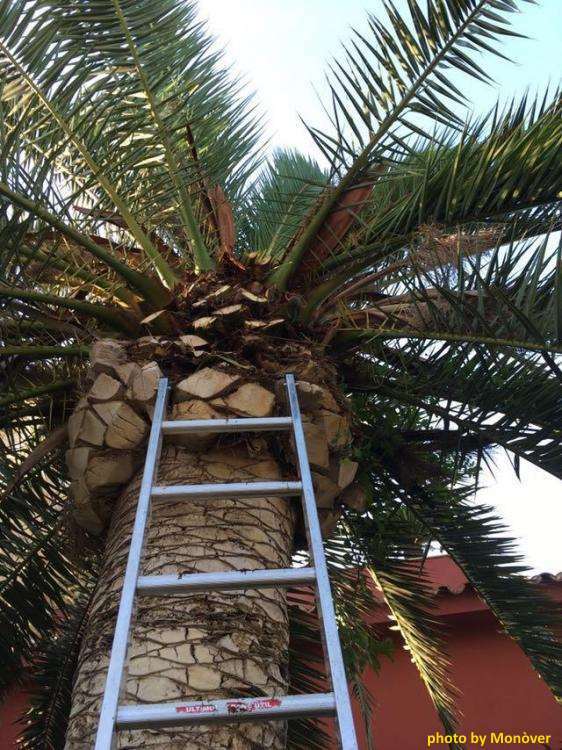 Consult our first aid guide for palm trees to exclude these matters. Thermal cameras, detection by micro radiation and also detection by sound waves are still under investigation, but may be useful detection methods in the future. 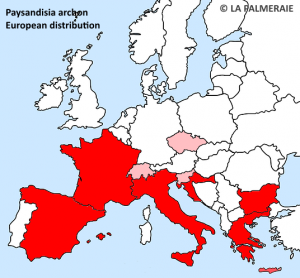 These parasites are a recent threat. No treatment is perfect (insufficient efficacy or harmful to the environment) but treatment is necessary. 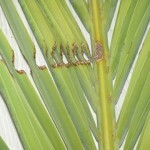 Without treatment not only the palm dies but also the pest continues unhindered. 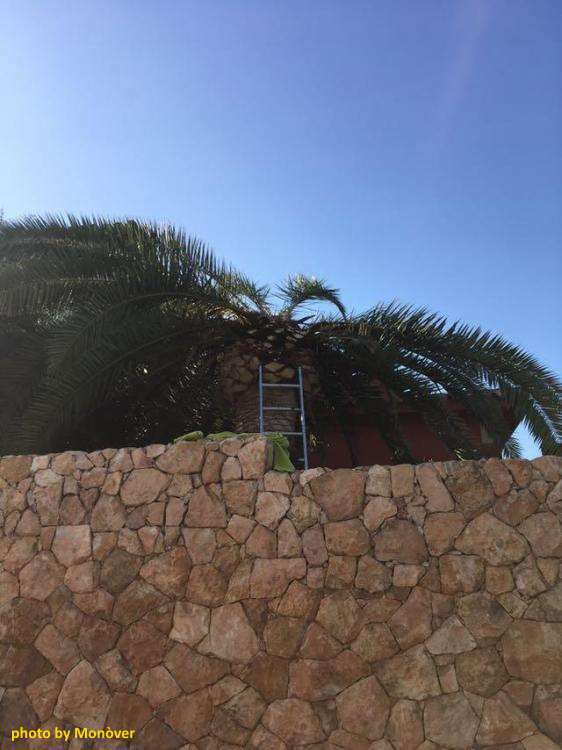 Palms that are too far damaged and cannot be rescued must absolutely be destroyed. Unfortunately, these precautions will never completely rule out the plague, but they will greatly reduce it. avoid pruning the leaves during the summer season. Especially when the leaf is still green. The insects scent it from very far away and are attracted by it. So only prune out of season (January-March) and only the brown, dry leaves. Still, not pruning does not completely rule out an attack. They penetrate deep enough deep into the crown of the leaves to find a laying place. 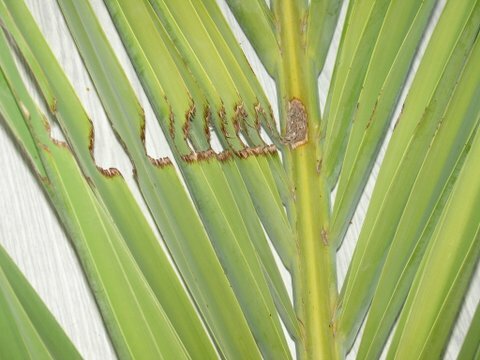 review the palm regularly and thoroughly, examine any possible damage to the petioles, especially if the leaf is different from the other leaves. In that case, test the strength of the leaf. The INRA institute from Montpellier has developed an adhesive called “Biopalm”. This is relatively expensive for the individual customer but very effective. The glue is only applied to the heart of the palm and upper part of the trunk using a compressor. The brown-colored adhesive layer acts as a trap. 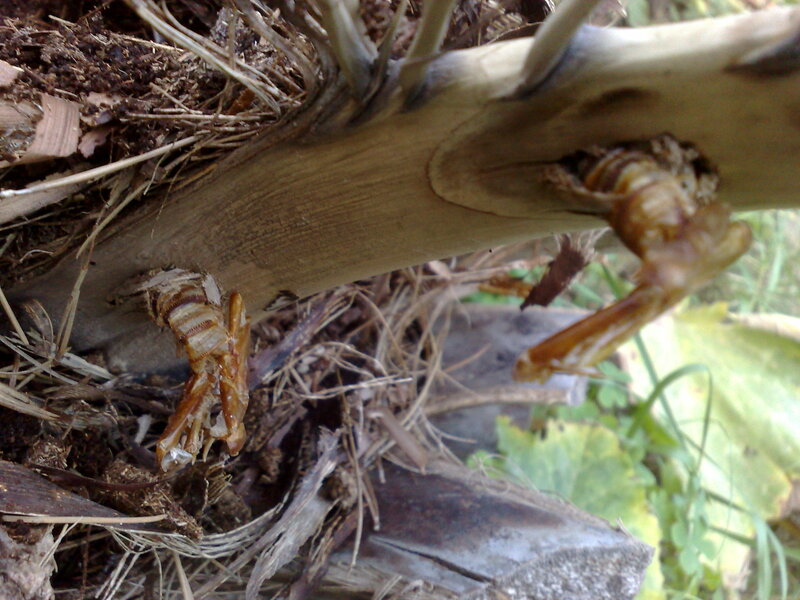 In some cases, the insects don’t even take the trouble to visit the palm anymore. The larvae that are already present adhere to the adhesive layer after the depopulation, making it impossible to fly out. The adhesive layer works for one year and a treatment costs approximately €150, – if you can apply it yourself. The treatment must be repeated every year, in June. If you start too early, uncovered spots may arise due to the growth. If you are later, the insects have already pounded their eggs. Preventive spraying with insecticide is not recommended. Insecticide does not work long enough and is too harmful for the environment. Only endotherapy (see lower) can also be used as a preventative measure. 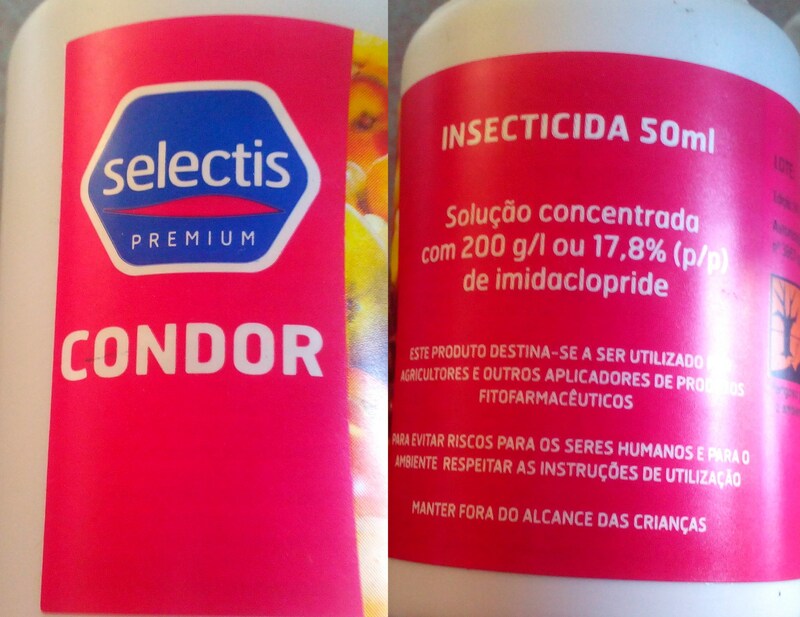 Insecticide (both chemical and biological) is effective when strong enough, applied correctly and at the right time. Please note that broad spectrum insecticide will not only kill the targeted, harmful insects. Therefore, avoid the flowers or better even remove them completely to save useful pollinators. Insecticide is useless when applied too late in the season. The insects are already in their impenetrable pupa. Treatment during the pounding period is ideal. For the correct application, dosage, period and duration of operation, the description on the packaging can be followed. 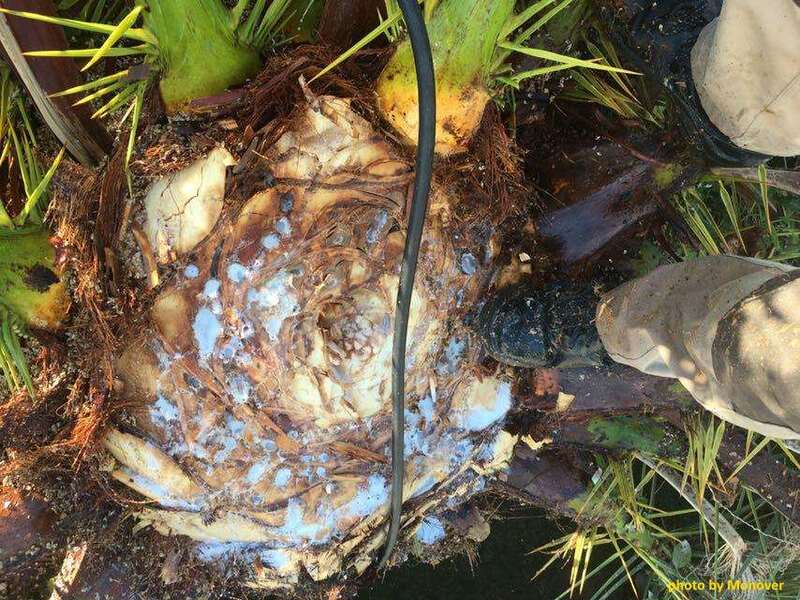 Only on the Trachycarpus may the dose be doubled because the moisture-retaining fibres can dilute the product. A dropper can also be a solution for such palms by hanging a plastic bottle with a small hole upside down above the palm. Thoroughly treat each part of the leaf crown and the top of the stem. 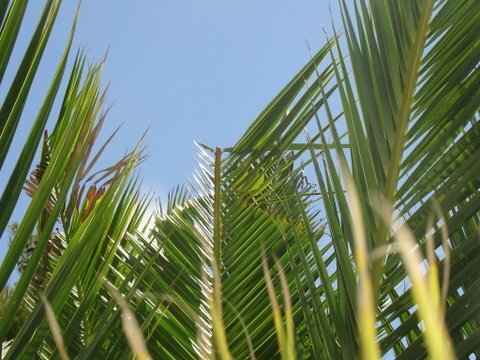 In some palms it can be very difficult to reach every part but avoid pruning leaves at all times in order not to attract the insects as described above. Treatments also exist in which an insecticide is injected into the trunk once only, but also for this purpose it is necessary to drill into the trunk. Moreover, this method is not very effective in species where the insects can only be found in the petioles and petioles and not in the trunk (e. g. in the Phoenix). Some useful components are: Deltamethin, Cypermethrin, Diflubenzuron. Condor (see picture) is recommended by some as the preferred means of choice. Unfortunately, it has become difficult to obtain through adapted legislation. 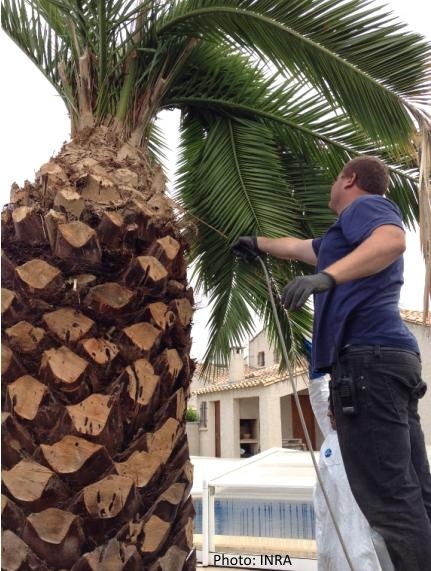 The product ‘DecisJ‘ sold in in local garden centres in France is well suited and so is the product ‘Klartan jardin‘ (tau-fluvalinate (3ml for 1,5 1.5 liters per palm to be applied in the crown). 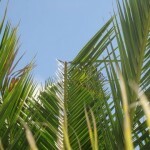 In some cases all the infected parts of the palm are pruned to leave healthy tissue only. Then holes are drilled on top of the heart and completely filled with insecticides. 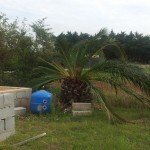 A professional method that was originally devised against the red palm weevil. But which also proved to be very successful in combating the palm moth. 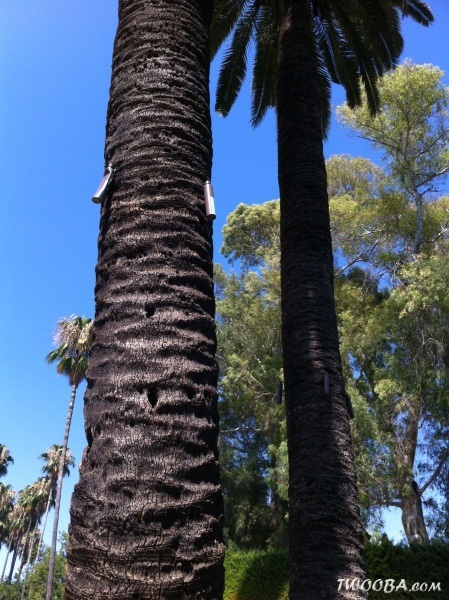 In this treatment, one or more holes are drilled in the trunk of the palm in which a long needle is inserted. Tubes are attached to these, which release a very strong poison during one year. The big disadvantage of this method is of course the drilling in the trunk. The advantage is that these can be used every year again. The nematodes are dissolved in water and this solution is then sprayed on the palm or even simply poured with a watering can. The treatment must be repeated several times, usually in May-June, late September and October-November. There are also pheromone traps that attract adult insects and subsequently infect them with nematodes. The insect then spreads the nematodes itself. Nematodes work best when it is damp and not too hot. Treatment in summer is therefore excluded. Nematodes have a very limited storage life. Further instructions are included when you buy the product. A very efficient but not very practical method. Adult males must be infected with the fungal infection in a laboratory. They are then released (and still have to survive). 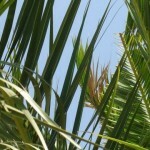 The fungi can also be diluted as grains and sprayed directly over the palm. However, it is far from always feasible to reach the insects sufficiently. The method is therefore not used much at the moment. Ostrinil (only against the palm moth): a professional method in which spores of this fungus destroy the larvae and the eggs of the palmmot. Adult specimens do not suffer from any nuisance but the cycle is broken. The application of the product is not dependent on weather conditions and can therefore also be used during hot, dry periods. 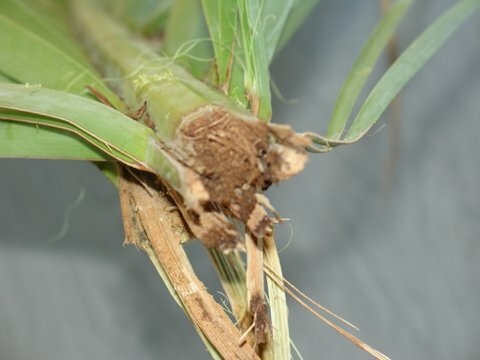 The treatment happens early in the season when the larvae come to the surface and during the laying period. For the most efficient operation, the treatment must be continued for two years. Very efficient against the red palm weevil. It smells the pheromones from far away. However, the palm moth smells the pheromones only at a very short distance (about 20cm). It finds its partner mainly on view. The pheromone trap usually contains pheromones, kairomones and a fermenting substrate. The disadvantage of this method is that not only these insects are trapped but others as well. Pheromone traps can be a good preventative way to detect the presence of the plague in time. It is very possible to make a trap yourself. On this French site there is a great explanation how to do so. Hand capture is very difficult and inefficient. The insects are not only impressive but also very fast and strong. Moreover, they do not scare off quickly. Cats, birds, rodents, hedgehogs, ants, ants, wasps, etc. 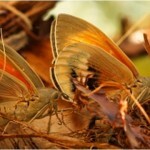 are all interested in both insects and/or their larvae/eggs. At the moment, however, it is still too little to keep the scourge effectively balanced. Nettle (Urtica) extract: too few experiences. Melia azedarach (Chinaberry tree): planting this tree (which is related to the familiar Neem which is used in the treatment of lice) near the palm would be described by some people is successful in protecting against pests. Covering: the entire leaf crown of the palm is packed in a large bag of fleece cloth. Of course only handy for smaller plants and therefore not practical. Moreover, this method is not very appealing neither. Useful when the palm is not contaminated yet or to isolate an infected specimen. Essential oil: very few experiences but still an interesting path. Among other things, the possibilities with oils such as citronella and garlic are examined.